A friend owns this classic wooden canoe and frequently paddles it on the Nimisila reservoir, one of the Portage Lakes. It is a serene place devoid of motor boats and jet skis. Indians used to travel the Cuyahoga River before portaging their canoes across what today we call the Portage Lakes area. 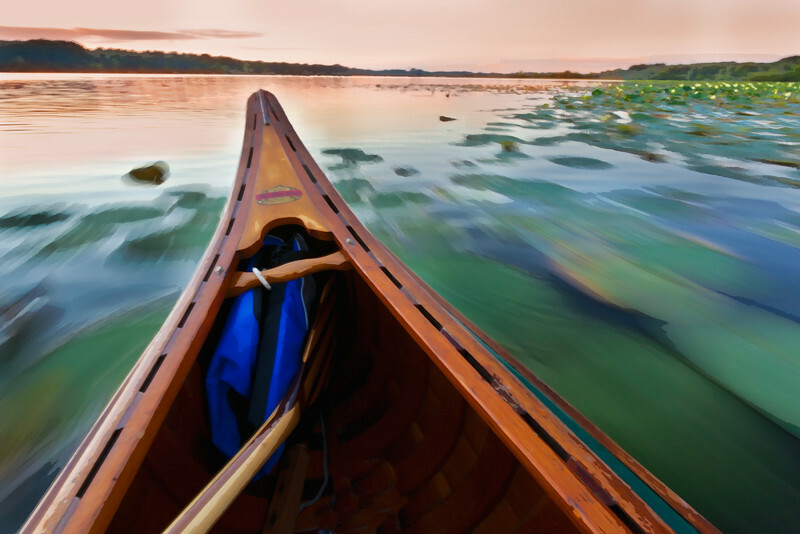 Perhaps the wooden canoe enhances the stillness of our natural experience. It is so quiet here. Using a long exposure can help enhance a sense of motion. Here the horizon remains static while the blurred lily pads in the foreground convey speed (we're actually moving slowly since I put my paddle down). This image was enhanced with some paintbrush strokes on the lilies and tree line. For me it has a painterly feel where the place and motion are more important than the specific details. The image is not centered, but is balanced by the lily blooms in the top right.